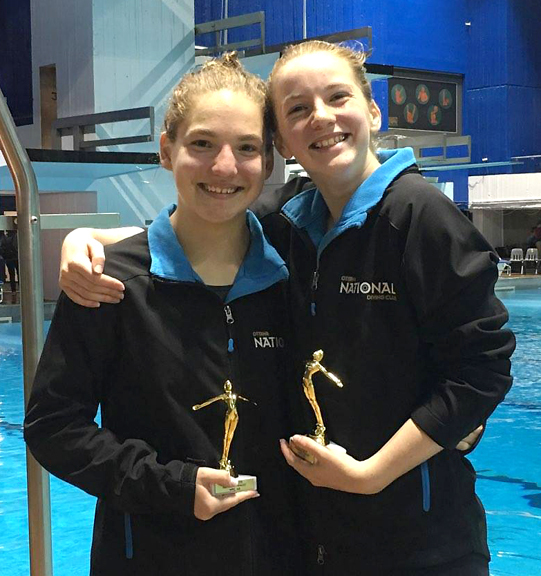 Hard to believe that the National competitive season is already over for Kathryn and Talia. 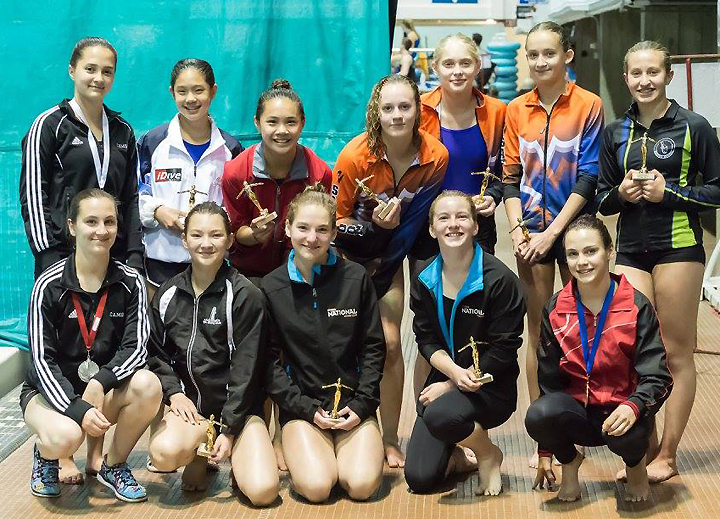 At the beginning of month Kathryn and Talia headed to Winnipeg for the final competition of the season. This season the Jr. Elite Nationals had been moved up to May instead of the end of July to help accommodate for major international competitions. This competition is definitely a marathon event with 2/3 days of training at the pool before the start of competitions followed by 4 days of individual and synchro events. Nationals are always an emotional rollercoaster filled with highlights and nail biting moments. I would say that Kathryn and Talia put down some excellent performances in prelims and finals and accomplished the goals they set out for themselves. Let’s begin with Talia. The competition marked her second national championships in her diving career. This being only her 3rd competitive diving season, the fact that she is at national championships is truly an accomplishment in itself. But Talia had bigger goals than that! Brennan and Talia’s goal was to make a national final and earn a top 12 finish! On the morning of her tower competition she pushed through pain in her foot and in preliminaries put down her best performance of the year setting a new personal best and achieving a top 10 placement and accomplishing her ultimate goal! In finals she ultimately finished in 12th place, but is now ranked as the top 12 best divers on platform for her age! On her 3m event two days after her tower event her foot continued to be a challenge to overcome and she competed steadily showing great technique but ultimately missing the additional height to complete the harder dives in her list. She finished in 15th in prelims. This was her very first national event on springboards and we are very pleased with her perseverance throughout the week. Congratulations Talia on a great season! Kathryn at the age of 14 is considered to be a veteran in the sport of diving and national championships are very familiar to her as this was her 6th nationals in her diving career. The diving community is very familiar with Kathryn and knows that she can put down some impressive dives and ultimately podium on any of her events. Going into nationals we decided to take some bigger risks with higher difficulty dives in her platform event in hopes of huge returns. In finals she finished in 9th place absolutely nailing her reverse two and one half on 10m going for 7.5’s! Her newest dive, a front 3.5 somersaults from 10m gave her a bit of trouble over the week but she was the only competitor in her age group competing this dive! Her shining moment of the competition came on the 1m event! She finished in finals with a BRONZE MEDAL and a new personal best. She showed great composure throughout prelims and finals, and already having one event under her belt, was in the groove of the competition. Her 3m event competition was a bit of a rollercoaster, some great highlights and some lows but that is the nature of the sport. Her prelims she finished in 3rd place but in finals just missing one dive can cost you enough points to miss the podium. She finished in 8th place at the end of the competition. It goes to show how fierce the competition is in this age group. Everyone is capable of greatness and it comes down to that one moment in time and making it count! Congratulations Kathryn on a great season and your 6th National Medal in your career! These girls have earned a well deserved rest and will return to the pool soon to work on some new skills and help prepare our younger athletes for their national championships coming up in Toronto on July 6-8! Stay tuned for the links to follow along online as Catherine, Audree and Charlee-Mae chase their goals in their final competition of the 2017-2018 season!